The Model 260 TS C2 Shredder is an innovative cross cut shredder that features an intuitive touch screen panel for operation. This office shredder offers robust level-4 security. Its carbon hardened precision cutting knives can reliably and securely shred papers, optical disks (CDs/DVDs/Blu-rays) and credit cards. It has the capacity of shredding up to 14 sheets simultaneously with a maximum speed of 12 ft./min. Its 10.26-inch wide feed opening allows inserting standard as well as wide format papers. The Model 260 TS C4 Shredder is a cross-cut shredder which is designed for shredding a variety of media such as papers, CDs, DVDs and credit cards. With security level 3, the shredder quickly shreds the material into 3/16x1 1/2" particles. Due to its secure shredding, it is perfectly suited for the organizations where data security is a critical issue. It shreds with the speed of 24 sheets per pass which enables it to shred 1000 sheets daily. The 10.25 inches feed size is pretty much to accept papers and documents of standard sizes. It has two separate sets of cutting blades for cuttings papers and CDs/DVDs. Its cutting blades are especially hardened so as not to get damaged by paper-clips or staple pins. The Model 260 TS S4 Shredder strip cut "Touch Screen" office shredder comes bundled with innovative features with a view to improve the overall user experience. Its intuitive touch screen allows for easy operation of the unit. This strip-cut shredder offer level-2 security which is ideal for shredding everyday documents. The 260 TS S4 can process up to 28 sheets of paper at a time through its 10.25-inch feed opening. Its carbon hardened cutting knives can reduce optical media (CDs/DVDs/Blu-rays) and credit cards to 1/8-inch bits. The office shredder also features an EPC (Electric Power Control) System that displays real-time shredding load and helps the operator optimize shredding efficiency. Professional Touch Screen shredder - Small/Medium Offices - Straight cut Carbon hardened cutting knives, unaffected by staples and metal clips. High precision design of cutting knives allows high shred loads with low power consumption. Motor thermal protection. 24 hours continuous duty motor: no duty cycle or timed cool down period. Bag full stop with light signal. Two separate set of cutting knives: one for paper and one for CDs. 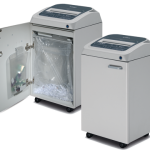 Two distinct integrated removable bins for separating shredded paper from plastic shreds. The Model 260 TS S5 Shredder processes transparent material too: keeping the finger for 5 seconds on the forward control and the machine works continuously for 30 seconds. The Model 270 TS C2 Shredder is an all around office cross-cut shredder that offers great security as well as high speed processing. It offers secure level-4 shredding. This cross-cut shredder supports an intuitive touch screen panel allowing the operator to use different functions of the unit. It can shred up to 17 sheets of paper (including paper clips and staple pins) at a time. With lubricated cutting knives, this office shredder can slice through optical media (CDs/DVDs/Blu-rays) and credit cards with ease. The precision-engineered blades allow for high shred loads with low power consumption. 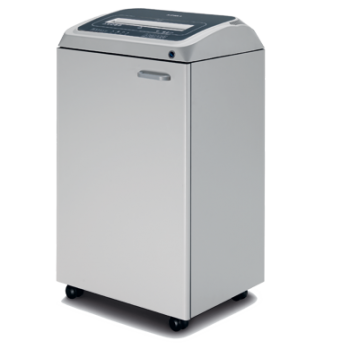 The Model 270 TS C4 Shredder is a cross-cut shredder that can shred documents, CDs, DVDs and credit cards. With the shred speed of 25 sheets per pass, the shredder is a perfect choice for the offices and departments with high-volume shredding needs. Its 10.6 inches feed size allows it to accept papers of varying sizes. Having security level 3, it ensures complete data security and confidentiality. The Model 270 TS S4 Shredder is a security level-2 strip cut office shredder boasting a range of innovative features such as an intuitive touch panel. It is perfect for low security high volume shredding. Its carbon-hardened blades can cut through a variety of materials besides paper such as credit cards, optical media (CDs/DVDs/Blu-rays), paper clips and staples. The strip cut shredder features a 10.6-inch throat and can quickly shred 29 sheets at a time with a maximum speed of 15 ft./min. A thermal protected continuous duty motor drives the 270 TS S4 office shredder without overheating. The Model 270 TS S5 Shredder is a strip-cut shredder having security level 2. With shred speed of 32 sheets at once, it can easily and quickly shred CDs, DVDs and credit cards. It shreds the material in to straight strips of 1/4". 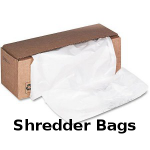 It is perfect for the organizations which need high-volume shredding with moderate security. Its cutting blades are specially designed to withstand heavy workloads. The cutting blades are hardened especially so that paper-clips and staples may not harm them. This also allows cutting blades to perform efficiently while consuming less power. The shredder is provided with two sets of cutting blades specified for separate shredding of papers and CDs/DVDs. The Model 310 TS CC2 Shredder is a touch screen office cross cut shredder that offers superior security while being able to handle high volume jobs at the same time. It is ideal for scenarios where confidential information needs to be disposed off frequently. This cross cut shredder can shred up to 19 sheets of paper (A4 70 gr.) at a time. Furthermore, it can also slice through plastic waste such as credit cards, optical media (CDs/DVDs/Blu-rays), paper clips and staple pins. The 12.2'' inch throat width of the 310 CC2 office shredder makes it ideal for a variety of paper sizes. The Model 310 TS CC4 Shredder is a cross-cut departmental shredder which is designed for high-volume shredding. Its high-end cutting blades are capable of cutting papers, CDs, DVDs and credit cards. The high precision design of cutting blades allows efficient shredding of paper-clips and staples. With security level 4, it leaves the material completely useless by shredding in 3/16''x1-1/2'' pieces. The Model 310 TS SS4 Shredder is a touch screen strip cut shredder designed especially for office use. Its level-2 security protocols make it ideal for less-confidential documents. It can shred various materials including papers, optical media (CDs/DVDs/Blu-rays) credit cards, staple pins and paper clips. This office strip cut shredder can process papers in high volume—up to 39 sheets at a time at a speed of 20 ft./min. Even though the 310 TS SS4 is a low-security shredder, it can destroy material with sufficient reliability by converting into 1/8 inch hard to reassemble strips. The Model 310 TS SS5 Shredder is a strip cut office shredder. It is a level-2 security shredder that can shred paper, optical media (CDs/DVDs/Blu-rays), credit cards, paper clips, and staples. It is a 'Touch Screen' shredder. It allows selecting the functions by just touching the screen. It also has an 'EPC (Electronic Power Control)' system. This displays the current shredder work load so that you can better organize the shredding. The 310 TS SS5 office shredder has a high sheet capacity of 47 sheets at a time!